The road warrior Saskatoon Blades finally returned home this past Sunday after travelling nearly 4000 kilometres over the span of 11 days, playing 5 hockey games along the way and going 3-1-1-0 in the process. The annual Western Conference road trips are always viewed as somewhat of a measuring stick to see how teams can handle the gruelling trip often taxed with an unfavourable schedule, a 2 hour time change, and of course a few bumps and bruises. Road trips are all about team bonding and this journey provided several different opportunities to do so. The first stop was Edmonton on Thursday where the team enjoyed a meal at owner Mike Priestner’s residence. Following the grub, the players and staff split up into smaller teams for some friendly competition in bowling, shuffleboard, video golf, and basketball. Well, it was mostly friendly. 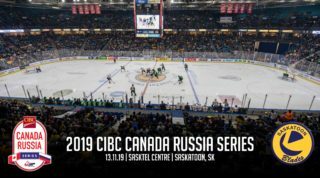 Friday morning it was back to business as the team made their way over to the big arena in downtown Edmonton for an early morning 8:00am practice at Rogers Place. 2018 1st round draft pick Colton Dach– who is currently playing his first season of midget with the Fort Saskatchewan AAA Rangers– joined the Blades on the ice. In 18 games this year with the Rangers, the younger Dach has 16 points. Colton will turn 16 in January but will not be eligible to play full time in the WHL until next season. The pit stop worked out perfectly since the team bus needed some mechanical attention before going any further, so the stop at the rink allowed for some local mechanics to get the iron lung up to snuff. Next on the map was beautiful Jasper National Park for a lunch break before making the trek through the mountains and onto Prince George. The Blades opened the 5-game schedule on the trip the following night; Saturday, November 24th, with a 4-1 win over the Cougars. Sunday morning Chase Wouters, Brandon Schuldhaus, Dawson Davidson, and Max Gerlach jumped on an early flight from Prince George to Vancouver for what was a long and unforgettable day. The rest of the team endured another 9 hours on the bus. Each year several players along with local police officers from the Saskatoon Police and RCMP travel to Vancouver to experience the consequences of substance abuse first hand. The players are given a tour of Vancouver’s infamous Downtown East Side area; a neighbourhood with one of the worst drug abuse problems in North America. 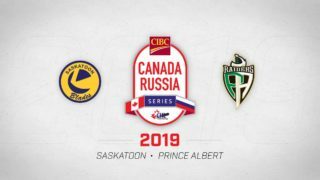 The trip is funded through several different ventures including the annual Project Face-Off golf tournament in Saskatoon, and local sponsors like the Saskatoon Optimist Club. The players then take their experience back to Saskatoon to share with students in a series of school presentations alongside local drug enforcement officers from the RCMP and Saskatoon City Police. Stay tuned for a video of the tour. Upon arriving in Vancouver, the team was met at the airport by the Saskatoon crew of both city police and RCMP officers. From there they went straight downtown to the Odd Squad Production headquarters– a special unit made up of current and retired Vancouver police officers with a focus on drug and gang education for youth. First up was a boat tour through the Vancouver harbour on a VPD boat. The Blades players were joined by several players from the BCHL’s Pentiction Junior A Vees, who were also taking part in project face-off that day. After the boat tour, the boys posted up in the classroom for a series of presentations from the Odd Squad. Two hour on drugs; everything from different kinds, where they come from, how they are made, what effects they have, and the business behind them. Then after a short coffee break it was another two hour presentation on gangs. Both segments were quite impactful on the young players since it wasn’t your typical “don’t do drugs” spiel. The message was delivered by police officers who have worked the beat in Vancouver, littered with graphic images and videos of the harshest consequences from both drugs and gangs. After a late supper as the evening turned into night, it was time to hit the pavement. The teams were split up with several officers accompanying each group through the streets and alleyways of Vancouver’s downtown east side. The walking tour was almost four hours long– by this time the rest of the Blades team and staff had arrived at the hotel in Langley from Prince George. Monday morning began with breaking news of a significant trade. 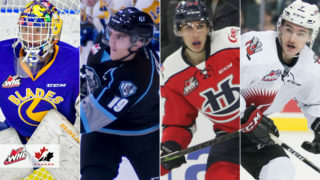 The Blades players said their goodbyes to 19-year-old Jackson Caller who was traded to his hometown Kamloops Blazers in exchange for fellow 19-year-old d-man, Nolan Kneen. The Blazers also received two draft picks in the deal. But then business resumed as the team took advantage of the day off to get a practice in, visit a local mall for lunch and some Christmas shopping, and most importantly a couple hours in study hall back at the hotel in the evening. Oh, and a special team meal with a surprise dessert for Assistant Coach Jerome Engele who was celebrating his 68th birthday. Tonight’s meal: BBQ ribs, spaghetti & alfredo, and salad w/ ice cream for dessert! It was somewhat strange to be on your 6th day on the road with only one game finished but Tuesday marked a big one– a date with the division leading Vancouver Giants and the first game in a stretch of 4 games in 5 nights. Nolan Kneen arrived late the night before so he was all set to make his Blades debut. The visiting Blades got out to a blazing start going up 3-1 in the first 10 minutes on the Giants, but eventually fell 5-3. Wednesday morning the Blades were back on the bus first thing heading to the ferry terminal in Tsawwassen for a trip to Victoria. The team bus was met with news of a mechanical problem on the ferry without an expected departure time. The delay was only about 90 minutes, so the team was on the water and across to the island with plenty of time to spare. Still, not ideal in terms of a game day preparation routine, but the Blades embraced the adversity in search of a bounce back performance after letting Tuesday’s game slip away in Vancouver. Blades netminder Dorrin Luding out duelled Victoria’s ace Griffin Outhouse leading the Blades to a 2-1 victory over the Royals later that night. Zach Huber had the game winning goal, his 1st in a pacman uniform. Prospect Chase Barlow and his family took in the action and weren’t disappointed. The next day– which was also a day off– provided a little more time to enjoy the ferry ride back to the mainland. It also happened to be sunny with double digit plus temperatures; a nice change for a group that spends the majority of their winter in Saskatchewan. Once back on land, it was back up into the mountains and onwards to Kamloops. Another long day spent in transit. ⛴ Beautiful day on the ferry! 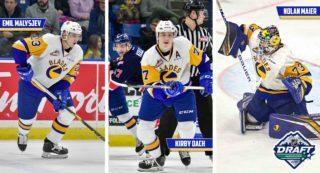 Friday was back to business as the Blades looked to build on their Wednesday night win over the Royals. A couple of former Blazers were looking forward to returning to play in their old barn, both for different reasons. For 20-year-old Dawson Davidson, it had been almost 2 full years since his last game in Kamloops. He was excited to have the chance to get one more game in where it all began, reminiscing on his first call-up as a 16-year-old before the game. Meanwhile, Nolan Kneen had to rip the band-aid off and return to Kamloops just days after being traded. Blazers fans showed their love for the “Kneen Machine” as he was welcomed back on the big screen during the first stoppage of the game– he couldn’t hold back his smile. Prior to the game, Kneen’s Kamloops billet family took in warmups on the visiting side of the ice displaying their custom made signs for Nolan. He even snuck in for a quick photo-bomb. The Blades ended up losing that night 3-2 in overtime to the Blazers, salvaging a single point. Nolan Kneen picked up an assist for his first point as a Saskatoon Blade and Emil Malysjev had one of the two Blades goals, which was the first goal of his WHL career. After the game, the Blades enjoyed a home cooked style meal at a small café in Kamloops called Frankly Coffee before departing for Kelowna. It received a rave review from Jerome “Beuf” Engele. The final stop on the trip and one last chance to steal two points from the B.C. Division before going home. It was also Kirby Dach’s 100th game of his young Western Hockey League career. Saskatoon got out to an early lead in the first period and at one point were up 4-2 in the third. But the road legs started to show and the Rockets found a way to tie the game late with an extra attacker. Thankfully, Dawson Davidson scored his 2nd goal of the night just 23 seconds into overtime to close out the trip in dramatic fashion. Then it was meal time and back on the bus– a happy bus to say the least, for a straight shot to the prairies. It was somewhat of a rude awakening considering the mild weather in Kelowna, but most of the team woke up to a blizzard in Airdrie, Alberta, for a breakfast pitstop. 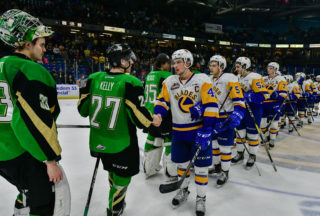 From there it was slow going for a while, and eventually the team pulled back into SaskTel Centre around 4:00pm to unload the bus and start their frozen cars. The Blades finished up the memorable adventure with 7 of a possible 10 points, sitting in 2nd place in the Eastern Conference with a 17-9-3-0 record. Saskatoon also checks off a large chunk of their road games games having played 18 of 29 away from home already this season. In those 18 road games, the Blades are 11-6-2-0. Saskatoon will now get set for a busy stretch before the holiday break which begins with a 3-in-3 weekend on Friday at home against the Moose Jaw Warriors. Then on Saturday, the Blades travel to Moose Jaw to complete a home and home with the Warriors. Sunday the Blades come home to entertain the Prince Albert Raiders at 4:00pm for the annual Teddy Bear Toss game.